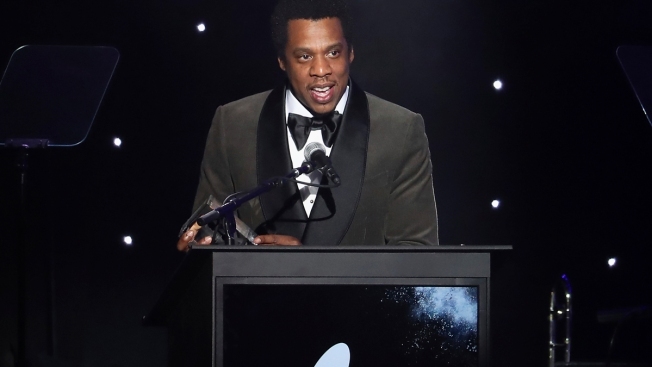 In this Jan. 27, 2018, file photo, honoree Jay-Z speaks onstage at the 2018 Pre-Grammy Gala And Salute To Industry Icons at the Sheraton New York Times Square Hotel in New York. Lawyers for Jay-Z say the Securities and Exchange Commission has gone on a "celebrity hunt" by demanding the rapper submit to unlimited questioning about various businesses. The lawyers wrote in a court filing Monday that he has agreed to testify for a full day before the regulatory agency but is opposing appearing for as many days as the SEC would like. A hearing on the matter is set for Tuesday in Manhattan federal court. The court filing was made in advance of the hearing scheduled by U.S. District Judge Paul Gardephe. The SEC has said it is investigating the Iconix Brand Group to learn if federal securities laws were violated when the company reported financial results. Jay-Z sold his Rocawear apparel brand to Iconix over a decade ago.